Wrayal and I decided to take a trip up Fir Mountain Road and see if the snow had melted. He loaded his dog, Jenny, into his DMC sidecar and met Walter and me at my house. We headed up Sywers Drive, which was impassable just a couple of weeks ago, and then up Fir Mountain to Huskey. We stopped where Andy and I had camped, to see if we had lost anything in the snow. There was an empty beer can and a plastic bag, which we retrieved. We loaded up and headed north on Huskey, to see how far we could get. Spring Excursion from Adventure Sidecar on Vimeo. We only went a couple of miles further before prudence made us turn around. The snow was slushy, maybe a foot or so deep. The Jeep ruts were just a little too wide for the sidecar tracks. It was getting pretty sketchy and the tracks we were following were growing fainter. Rather than risk getting stuck we turned around. 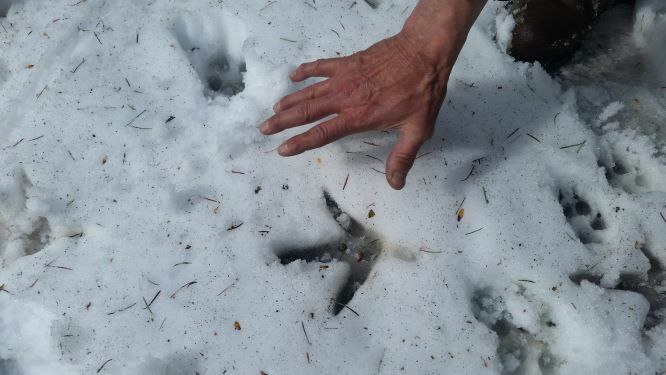 We came across some velociraptor tracks in the snow. Retracing our path was uphill and there were a few spots where it looked like we might get stuck, but we stayed on the throttle and were able to power through. We stopped and had a picnic of venison peperoni ( thanks Scott!) washed down with hot chocolate laced with rum and Irish cream. We picked a bit of garbage to pack out while the dogs played in the snow. We poked around a bit on the way home, spending a very pleasant Sunday in the woods.